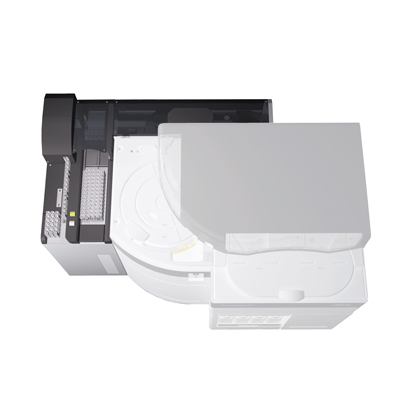 The AccuTOF™ GCx-plus is the most advanced mass spectrometer system of the AccuTOF™ GC series products. The AccuTOF™ GCx-plus provides solutions in a variety of applications. 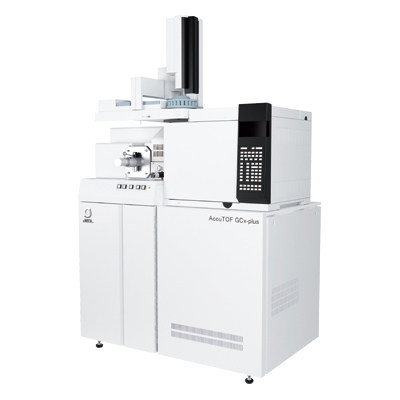 The JMS-T200GC AccuTOF™ GCx-plus GC-TOFMS is a high-end GC-MS system, which achieves high mass resolution, high mass accuracy, high sensitivity, fast data acquisition, and wide mass range. 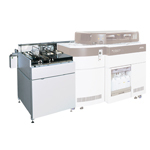 A new automatic analysis system provides high-throughput, high-accuracy qualitative analysis solutions. 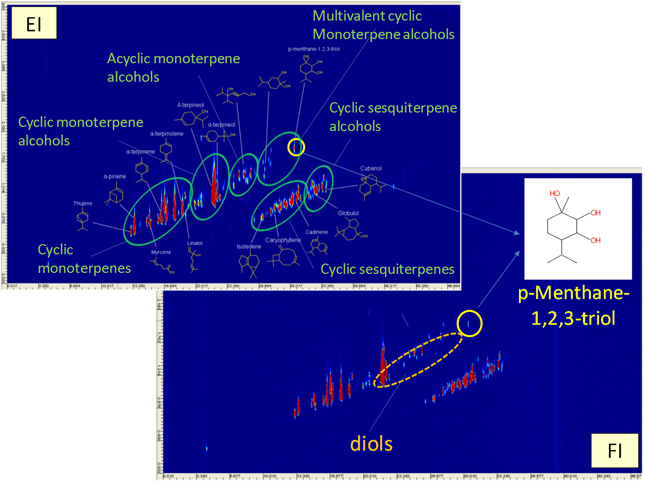 Three new functions are incorporated in the new GC-MS system, which allows high-accuracy qualitative results to be obtained by anyone. 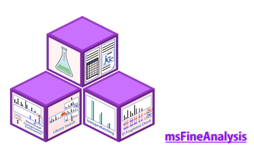 The new automatic analysis software “msFineAnalysis” conducts five kinds of qualitative analyses that combine GC/EI data and soft ionization data (CI, FI, PI). By presetting "m/z" value used for drift correction and timing to introduce the internal standard sample, drift correction is automatically implemented after measurement. Since the measured data are already subjected to drift correction, these data are immediately analyzed by “msFineAnalysis” software. Valve control can be made through the software. The timing to introduce the internal standard sample, aimed at mass calibration (drift correction), can be set flexibly. 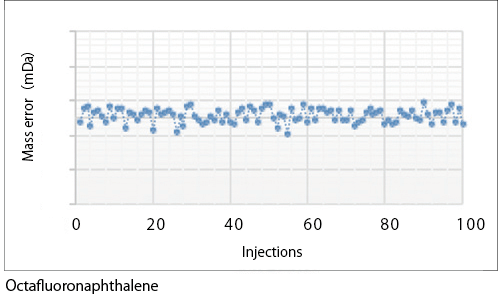 Multi-point correction using a drift correction multiplier achieves high mass accuracy. This drift correction multiplier can be linked to the Reservoir Automatic ON/OFF function. 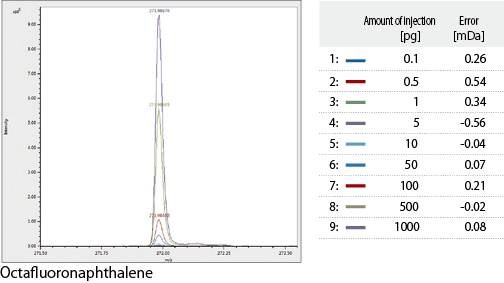 This automatic system provides higher accuracy GC-MS qualitative analysis results than the results obtained only from library search. The system offers both shortened data analysis time and superbly high accuracy analysis results. The AccuTOF™ GCx-plus accommodates various soft ionization techniques, as well as Electron Ionization (EI). These soft ionization techniques are also effective for the integrated analysis using “msFineAnalysis” software. 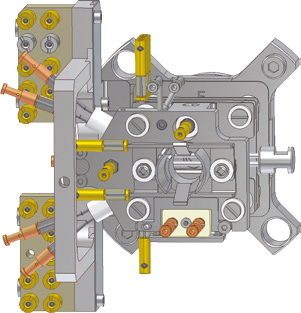 Two combination ionsources enable quick switching between EI and soft ionization without degrading the vacuum in the chamber. In addition, the AccuTOF™ GCx-plus allows for analysis with direct techniques including Direct Exposure Probe (DEP), Direct Insertion Probe (DIP) and Field Desorption (FD). 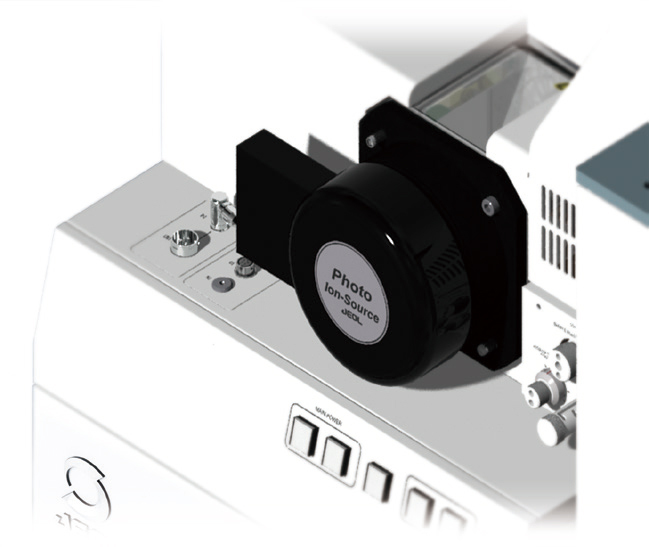 The system also supports direct sample inlets for analysis of low volatile compounds and high boiling-point compounds. High speed data acquisition speed, up to 50 spectra/sec, is suitable for GCxGC-TOFMS analysis that provides ultrahigh separation data. 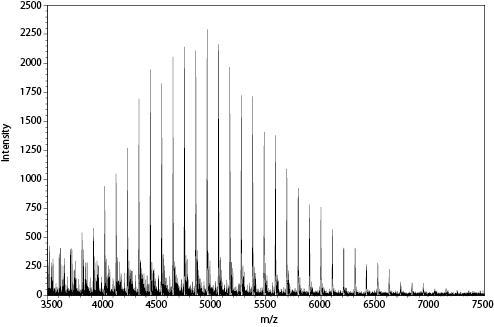 This GCxGC analysis can also be made with soft ionization. 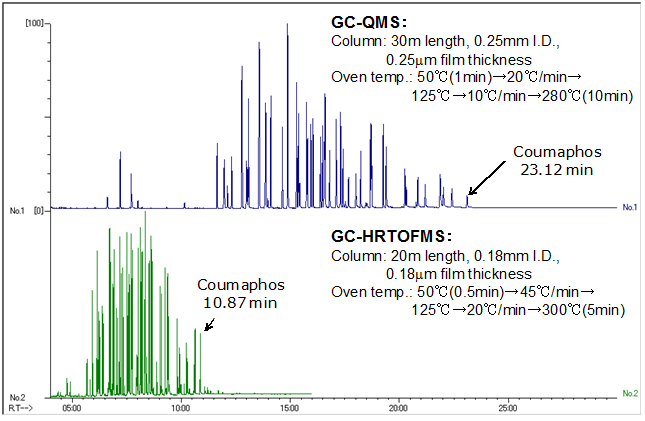 Ultrahigh separation analysis offered by GCxGC is effective for analyzing complex-mixed compounds measurement. The AccuTOF™ GCx-plus enables analysis by combinations with various pre-treatment equipment, like the JMS-Q1500GC (GC-QMS) does. Thus, its applications extend by the combinations with Head space method, SPME method, Pyrogenic method, and Thermogravimetry. Trace amount of components can be analyzed qualitatively and quantitatively. 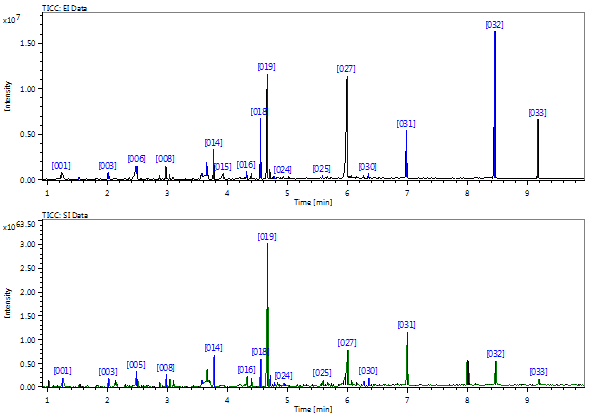 Octafluoronaphthalene (OFN) 100 fg was continuously measured (8 cycles) by EI method and EIC (m/z 271.9867) was acquired. 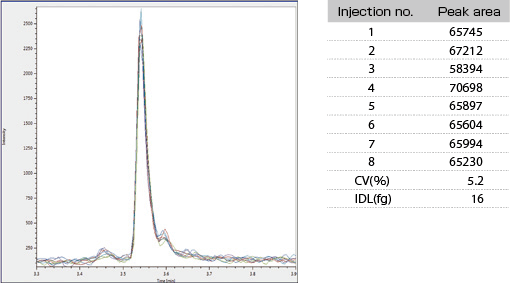 Based on the repetition accuracy of the obtained peak area of this EIC, statistical calculation was conducted for the instrument detecting lower limit (IDL) by assuming certain reliability, resulting in 16 fg of IDL. 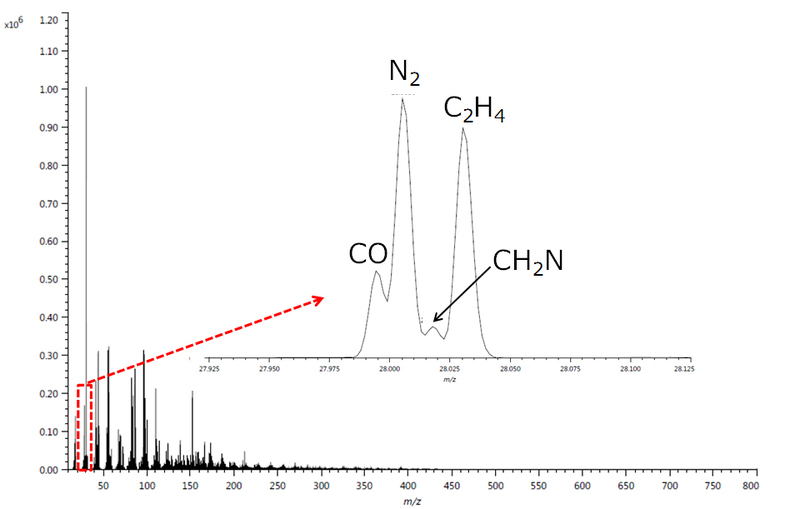 Accurate mass analysis of the detected ions enables the chemical formula of ion to be obtained. The system allows for separation of adjacent mass peaks with a few 10 mm Da. Figure below shows that four kinds of ions having the same integer mass of 28 Da are clearly separated and detected owing to high resolution of the system. 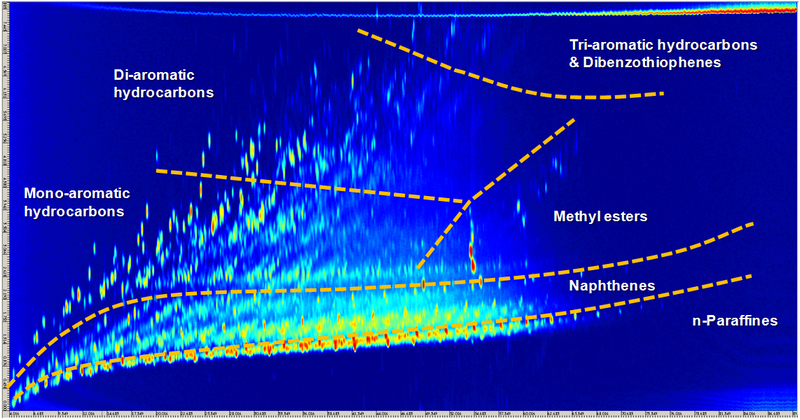 With a low resolution system, these ions are not separated and detected and thus, the observed mass peak is only one, leading to non-accurate acquisition of elemental composition and intensity (quantitative value). The AccuTOF™ GCx-plus enables accurate qualitative and quantitative analyses by separating adjacent mass peaks with a few 10 mm Da. 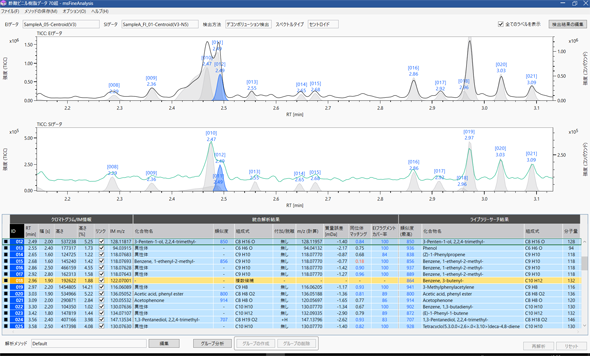 The system supports GCxGC analysis and Fast GC analysis with a high speed data acquisition up to 50 spectra/sec. The AccuTOF™ GCx-plus has a wide mass range and incorporates various direct sample-inlet techniques, thus allowing for measurement of samples with large molecular weight, which cannot be introduced by GC. 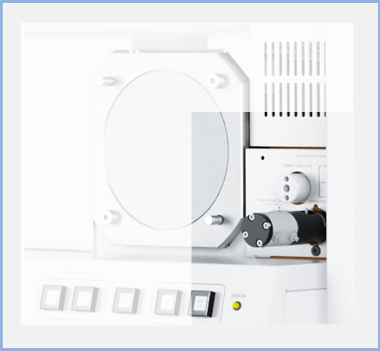 The AccuTOF™ GCx-plus has a wide mass range up to 4 orders of magnitudes, thus the system fully supports quantitative analysis as a GC-MS.
*The photo of the instrument appearance may include options.